This is a superb room with en-suite marble bathroom and cherry wood wardrobes. The bedroom looks out on to the canal at the front of the house through gothic arched windows which are glazed with traditional 'bottle bottoms'. The bed is kingsize (1.6m wide). It is an elegant room with travi visti - visible wooden beams - which are hand painted and with wall covered in silk fabrics. The floor is a beautiful example of Venetian terrazzo, a mosaic of mutli-coloured marbles. There is wi-fi if needed and an ipod docking station. In the bathroom there is a bath/shower and jacuzzi, wc & bidet. This charming room with two single beds is furnished in a similar way to the Large Double being expensively decorated with traditional Venetian marble terrazzo floor, silk wall hangings and cherry wood wardrobes. It has a separate dressing room and table making the room bigger than it initially appears. There is also an ensuite bathroom decorated in marble and onyx which includes bath, bidet, wc & basin. All bedrooms benefit from good water presssure as the house is equipped with water pumps to increase the usual dismal water pressure in Venice. On the top (second floor), the mansarda double as its name suggests was created from the roof / loft space of the original house. It is in fact the biggest of the bedrooms in floor area and some people love it. Being more modern for others it lacks the traditional Venetian character they are looking for when they come to Venice. 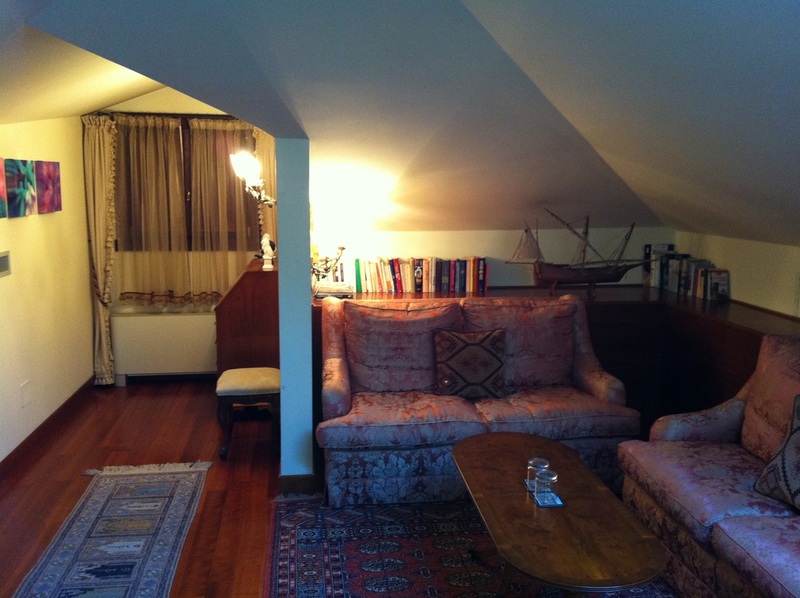 As you can see from the picture the bedroom has a seating area around a coffee table. The kingsize (1.6m wide) double bed is in an alcove on the left side of the room. The large bathroom is across the landing and has a good-sized power shower cubicle. The view from the window is down the canal which leads up to the house. Also on the top (second floor) this is a pretty bedroom and one barely notices the slightly reduced ceiling height. 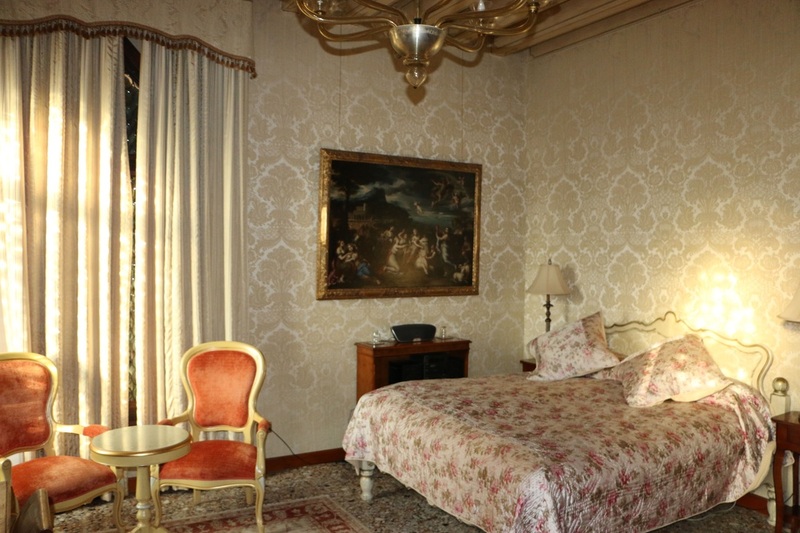 The bedroom has two single beds with a postcard view from the window of the garden and canal to the side of the house. It has a small but fully equipped en-suite bathroom (with bath, bidet, wc and basin) and hanging space for clothes in the lobby between bathroom and bedroom. In common with all the bedrooms, the mansarda twin as air-conditioning.